Today, Elle from Living In Color Style and I are bringing you a rare weekend post to talk about NYE! NYE is this week and it is always a great time to get dressed up! I tend to lean toward sparkles on NYE! This year, I am leaning towards fun tights! (it is supposed to be bitter cold) They are a great way to add a little pop of fun to your outfit! Be sure to check Elle's blog! Thanks Ginny! Hopefully, you can find new pair! The tights are great...and I think I've told you before, but I love that coat! That coat is fantastic!! And the tights! Love! Lovely and again, I LOVE those tights. Happy New Year....XO! These are such cute tights. Fabulous look! That coat is so pretty! tu abrigo es una pasada! que bonito! Those tights are amazing and the color of that coat is to die for! I love both of you ladies! You both have such impeccable taste! Love both of these looks! 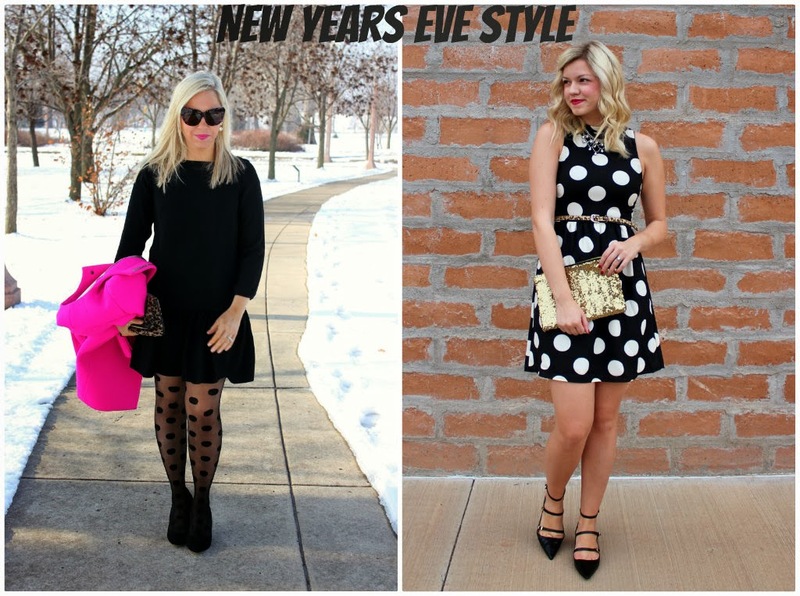 Sequins aren't the only option for NYE...polka dots work too! Great outfit choice for New Year's Eve, and you are a brave soul to do some photos sans coat for the sake of showing the dress! Brrr! (Although the snow certainly makes for pretty pictures!) The pink of your coat and lip color are gorgeous on you. Thank you! You are so sweet! It was a cold one! Those tights are too perfect for the holidays, I need to get a pair! You look absolutely stunning! 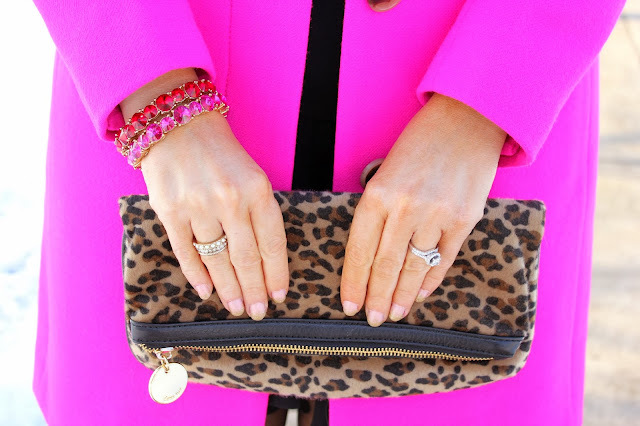 That coat is so fun--the perfect way to make winter a little more cheerful! so gorgeous and bright! The coat is just over the top fab…and loving those tights!!!! Us blondes can definitely rock the hot pink! gorgeous! i went for a blazer and tee this year. i was overdressed but i didn't care, hehe.